We use a small (3-4 cm) incision, that often blends in with a natural skin crease. Many thyroid lesions are treatable by this technique and often result in same-day surgery. We are the first in this community to offer this procedure, which was developed in Italy. Some larger thyroid lesions can only be treated by traditional larger incisions. In those cases we have extensive experience with more traditional open techniques. This picture is typical of the incisions we use for most thyroid procedures. During all of these procedures, we use NIMM nerve monitoring, to identify and protect the nerves which control the vocal cords. Adding the NIMM monitor has helped improve the safety of these procedures. Thyroid cancer is present or a nodule is suspected of being cancer. Hyperthyroidism which cannot be treated with medicine or radioactive iodine. Total thyroidectomy. Your surgeon will remove the entire gland and occasionally the lymph nodes surrounding the gland. Both sections (lobes) of the thyroid gland are usually removed. Additional treatments with thyroid stimulating hormone (TSH) suppression and radioactive iodine work best when as much of the thyroid is removed as possible. Thyroid lobectomy with or without an isthmectomy. If your thyroid nodules are located in one lobe, your surgeon will remove only that lobe (lobectomy). With an isthmectomy, the narrow band of tissue (isthmus) that connects the two lobes also is removed. After the surgery, your nodule will be examined under a microscope to see whether there are any cancer cells. If there are cancer cells, your surgeon will likely perform a completion thyroidectomy at a later time. Subtotal (near-total) thyroidectomy. Your surgeon will remove one complete lobe, the isthmus, and part of the other lobe. This is used for hyperthyroidism caused by Graves disease. Success of a thyroidectomy to remove thyroid cancer depends on the type of cancer and whether it has spread (metastasized) to other parts of the body. You may need follow-up treatment to help prevent the cancer from returning. Larger tumors may require lymph node resection at the tiime of surgery. Thyroid cancer represents about 1% of all malignancies. The most common types of thyroid cancers are papillary thyroid cancer (75-85%) and follicular thyroid cancer (10-20%). Papillary thyroid cancer has a distinct appearance under the microscope, which allows its diagnosis with fine needle biopsy. Follicular thyroid cancer closely resembles normal thyroid cells on a needle biopsy, and must be diagnosed by removal of the tumor. Because folicular tumors cannot be diagnosed preoperatively, we recommend thyroid surgery for any suspicious lesion. The prognosis of thyroid cancer is related to the type of cancer and the stage at the time of diagnosis. The 5 year survival rate for stage 1 and stage 2 papillary and follicular thyroid cancer is 100%. 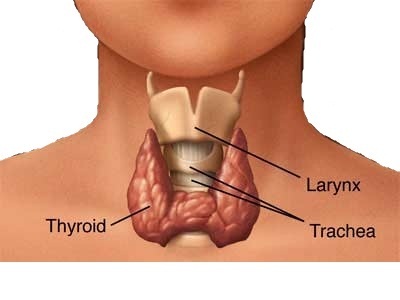 If you have a total thyroidectomy, you will need to take synthetic thyroid hormone for the rest of your life. If you have a lobectomy or subtotal thyroidectomy, you may develop hypothyroidism and you may need to take thyroid medicine for the rest of your life. If you have thyroid cancer, you will most likely be treated with radioactive iodine after surgery to make sure that all the thyroid tissue and cancer cells are gone. It is always your surgeon's goal to remove as little of the thyroid gland as possible. If cancer is present, then your surgeon wil likely remove the entire gland. After surgery for hyperthyroidism, some people will have low calcium levels and may need to take calcium supplement medications.